If you need an economic model that will predict the behavior of Willard Romney, simply look at his Bain Capital subsidiary, Clear Channel Communications™. It is a company that has recently fired thousands of lower wage employees while giving two incredibly hate-mongering misogynist bigots undeserved raises of obscene proportions. Obviously the raises are not based on merit. In 2011, Glenn Beck’s ratings dropped 50%. Bain and Clear Channel, under Willard’s guidance I imagine, recently DOUBLED HIS SALARY!! Perhaps because Glenn Beck is a member of Willard’s LDS club? Who knows? It’s certainly not because of his performance. In light of Rush’s recent misogyny with the Sandra Fluke incident, he has lost over 51 sponsors yet has not suffered a single admonishment from his bosses at Bain Capital. It’s interesting to note the timing of some of these mass firings. The first round happened in March of 2009, Clear Channel fired 1500 plus employees. Does anyone believe this wasn’t another calculated attempt by right wing business to help tank the economy? The timing couldn’t have been worse for American workers. If these monsters cared one bit about profit, Limbaugh and Beck would have seen their salaries unchanged. So, America, we see the motive for everything Willard, Bain and their band of obstructionist bastards in the Senate do: SPITE. This is a mere preview of what’s to come. If you are a loud, white, preferably LDS bully, you are guaranteed a prominent spot in the Romney administration. Perhaps we can then solve the very pressing question: where’s the birth certificate? When that relevant issue is resolved, we can focus on jobs. Except the focus will be on getting rid of them to make Bain even more powerful. Frightening! 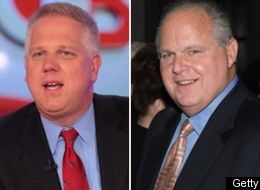 Maybe Clear Channel is concerned that Limbaugh and Beck would get an offer from MSNBC.